The famous "Afghan girl" immortalised in a 1985 National Geographic magazine cover is facing investigation in Pakistan after she was found living in the country on fraudulent identity papers. Sharbat Gula, then a 12-year-old, was shot by National Geographic photographer Steve McCurry in a refugee camp. 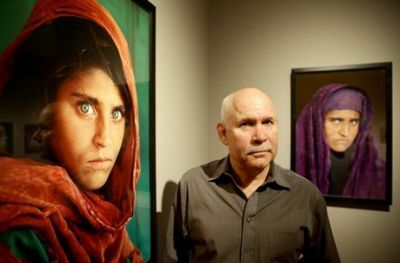 McCurry in 2002 tracked Gula down to a remote Afghan village in 2002 where she was living married to a baker and the mother of three daughters. But Pakistani officials now say that Gula applied for a Pakistani identity card in Peshawar in April 2014, using the name Sharbat Bibi and was one of thousands of Afghan refugees who managed to dodge Pakistan's computerised system and to get an identity card last year. Faik Ali Chachar, a spokesman for the National Database and Registration Authority, told AFP the Federal Investigation Agency was probing Gula's case. "This is one of the thousands of cases which was detected last year and sent to the FIA. We are waiting for the findings of the inquiry," Chachar said. "Our vigilance department detected (the) Sharbat Bibi case in August 2014 and sent it to FIA for further investigation the same month." An AFP reporter visited the poor Peshawar neighbourhood given as Gula's address in her papers, where residents said she had been living with her husband, who worked in a local bakery, but had left a month ago. A senior official in NADRA's Peshawar office said all the documents she used to get the card, which only Pakistani citizens are entitled to, were fake and her "sons" were likely also not related to her.